Our thoughts and prayers go out to those that have been affected by Hurricane Sandy. Earlier this week, as the situation worsened, we reached out to Dell employees to give them the opportunity to aid disaster relief efforts working with the American Red Cross. Through our Powering the Possible commitment, Dell provides an opportunity to match employee contributions to qualified charities, dollar for dollar, up to $10,000. Last year, employees gave nearly 420,000 volunteer hours and donated $12 million to global charities of their choice as part of this commitment. Dell is here to support customers affected by Hurricane Sandy. 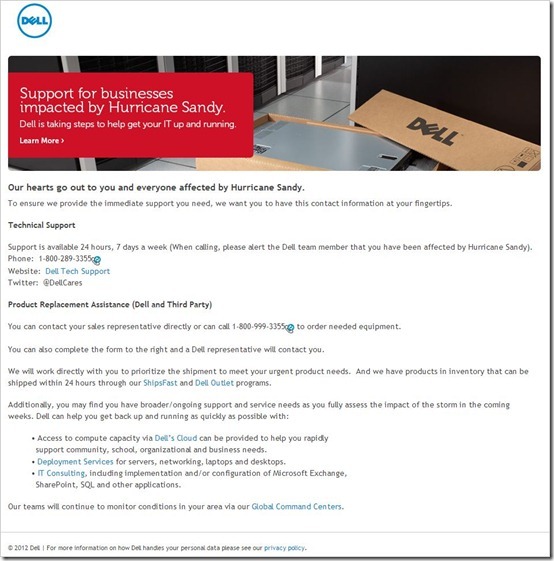 The screenshot below is information on Dell.com that contains details about getting technical support, product replacement assistance and more.